Gathered together in one place, for easy access, an agglomeration of writings and images relevant to the Rapeutation phenomenon. YOU ARE REQUIRED TO READ THE COPYRIGHT NOTICE AT THIS LINK BEFORE YOU READ THE FOLLOWING WORK, THAT IS AVAILABLE SOLELY FOR PRIVATE STUDY, SCHOLARSHIP OR RESEARCH PURSUANT TO 17 U.S.C. SECTION 107 AND 108. IN THE EVENT THAT THE LIBRARY DETERMINES THAT UNLAWFUL COPYING OF THIS WORK HAS OCCURRED, THE LIBRARY HAS THE RIGHT TO BLOCK THE I.P. ADDRESS AT WHICH THE UNLAWFUL COPYING APPEARED TO HAVE OCCURRED. THANK YOU FOR RESPECTING THE RIGHTS OF COPYRIGHT OWNERS. Bt cotton hybrids are pointing to drastic depletion of soil nutrients due to repeated cultivation. Crop failures and less yield from the use of transgenic seeds are causing suicides among Indian farmers. The Coalition for GM-Free India has issued a new report. It has been 10 years since Bt (Bacillus thuringiensis) cotton was officially introduced to India, and while promoters and manufacturers want the world to believe that it is an unqualified success, the reality is very different. The Coalition consists of a large network of scientists, farmer unions, consumer groups and organizations. Farmers in India were promised miraculous crop yields using Bt cotton. 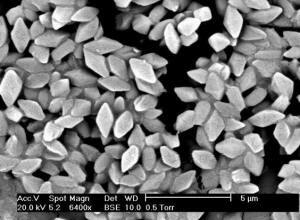 Spores and crystals of Bacillus thuringiensis serovar morrisoni strain. The Hindu reports that the hype over Bt cotton is typified by recent advertisements by Mahyco-Monsanto claiming “Bollgard boosts Indian cotton farmers' income by over Rs.31,500 crores.” However, the Advertising Standards Council of India states that this is false information. The report by the Coalition for GM-Free India stresses the deep crisis in cotton farming after 10 years of using transgenic seeds. In the period 2011-12, the spate of farmer suicides has been largely among Bt cotton farmers. Not only do the farmers suffer when crops fail, but they cannot afford to buy seeds for each crop. According to state government estimates in December 2011, during the Kharif 2011 season in Andhra Pradesh, of 47 lakh acres planted with Bt cotton, 33.73 lakh acres suffered from crop failure. 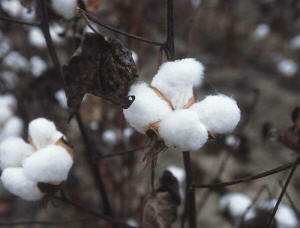 In other words, two-thirds of the cotton area had a yield loss of more than 50%. In the Maharashtra area, poor performance of the cotton crop has led to a significant lowering of production estimates despite the increase in cotton cultivation in the area. The crisis in cotton cultivation last year caused the Maharashta government to announce a bailout for cotton, paddy and soyabean crops of Rs 2000 crores. Bt cotton was approved in 2002, but the initial adoption of the crop was slow. By 2004-05 only 5.6% of cultivated cotton was Bt. Data from the Central Institute of Cotton Research (CICR) shows increasing areas under Bt cotton and decreasing yields. Comparing the periods 2005-06 to 2011-12, a different story emerges. In the pre-Bt cotton era, due to non-Bt hybrid seed and other facts, yields were already rising sharply. In the next 5 year period, the yield increased by 69%. From 2005-06, utilizing Bt cotton, a moderate 17% increase was achieved up to 2007-08. (554 kg/ha compared to 470 kg/ha). Since then the yields show a downward trend. Now in the period 2011/12, cotton yields have reached the pre-Bt levels of 480 kg/ha compared to 470 kg/ha, which is only an initial estimate by the Cotton Advisory Board. The report says that the actual number is likely to be lower than that. The paper stresses the use of irrigation facilities to bring new farmlands under Bt cotton, well distributed rainfall and low pest activity. The shift towards hybrid cotton and pesticides with novel modes of action are important in helping cotton productivity, not just the introduction of the Bt gene. According to his report, Dr Kranthia says that due to repeated cultivation of Bt cotton hybrids, there has been a severe depletion of nutrients in the soil. The Bt crops draw more water and nutrients from the soil and now are exhibiting nutrient deficiency. In the rain-fed zones, crops are suffering from leaf-reddening and wilt problems, which are getting more severe as years go by. In spite of the extensive government data and the report by Dr Kranthia, Union agriculture minister Sharad Pawar has praised Bt cotton in Parliament. He says that the high quality hybrid cotton seeds had helped farmers "make big gains due to reduced use of pesticides." The truth of the situation seems to be rather different. On the 10th anniversary of the introduction of genetically modified (GM) Bt cotton to India, angry farmers protested and urged parliamentarians to hold a special session. They implored parliamentarians to discuss the issue of Bt cotton and to ban the technology in India. A few seed companies, particularly agro-giant Monsanto, are monopolizing the seed industry in India. The social activists say that these companies are "setting the agenda" for the government and that the government should "reject the hype" around Bt cotton and demand a more comprehensive review of the product. “The crisis in the cotton belt should be closely examined and critically re-assessed,” they said. Protests were lead by the Delhi Alliance for Safe Food in Jantar Mantar and similar protests arose in the cotton areas of Madhya Pradesh, Andhra Pradesh, Karnataka and Maharashtra. The Bt cotton technology was intended for irrigated areas, but was pushed on all cotton-growing states including the rain-fed areas. This caused a higher rate of suicides in cotton growers, especially in Maharashta, due to crop failures. Because of the high suicide rate in this state, protests were more intense -- farmers burned Bt cotton crops in many villages, according to the Vidarbha Jan Andolan Samiti. The protests included several wives of farmers who had committed suicide. The protesters and activists have demanded that the Indian government returns to the production of conventional cotton seeds. They say that the government should also advise farmers about the risks of planting Bt cotton. They demand that there should be a strict action against misleading advertising and false claims by the seed companies, including Monsanto. Kausalya Shende standing in the field where her brother’s cotton crop failed three times this year — twice for lack of rain and once from flooding. BHADUMARI, India — Here in the center of India, on a gray Wednesday morning, a cotton farmer swallowed a bottle of pesticide and fell dead at the threshold of his small mud house. Villagers in Bhadumari gathered in the house of Anil Kondba Shende and looked at his body as the local police investigated his suicide. The farmer, Anil Kondba Shende, 31, left behind a wife and two small sons, debts that his family knew about only vaguely and a soggy, ruined 3.5-acre patch of cotton plants that had been his only source of income. Whether it was debt, shame or some other privation that drove Mr. Shende to kill himself rests with him alone. But his death was by no means an isolated one, and in it lay an alarming reminder of the crisis facing the Indian farmer. Across the country in desperate pockets like this one, 17,107 farmers committed suicide in 2003, the most recent year for which government figures are available. Anecdotal reports suggest that the high rates are continuing. Though the crisis has been building for years, it presents an increasingly thorny political challenge for Prime Minister Manmohan Singh. 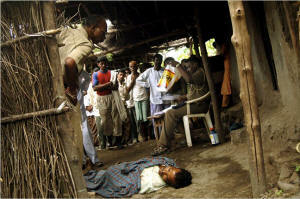 High suicide rates and rural despair helped topple the previous government two years ago and put Mr. Singh in power. Changes brought on by 15 years of economic reforms have opened Indian farmers to global competition and given them access to expensive and promising biotechnology, but not necessarily opened the way to higher prices, bank loans, irrigation or insurance against pests and rain. Mr. Singh’s government, which has otherwise emerged as a strong ally of America, has become one of the loudest critics in the developing world of Washington’s $18 billion a year in subsidies to its own farmers, which have helped drive down the price of cotton for farmers like Mr. Shende. At the same time, frustration is building in India with American multinational companies peddling costly, genetically modified seeds. They have made deep inroads in rural India — a vast and alluring market — bringing new opportunities but also new risks as Indian farmers pile up debt. In this central Indian cotton-growing area, known as Vidarbha, the unofficial death toll from suicides, compiled by a local advocacy group and impossible to verify, was 767 in a 14-month period that ended in late August. India’s economy may be soaring, but agriculture remains its Achilles’ heel, the source of livelihood for hundreds of millions of people but a fraction of the nation’s total economy and a symbol of its abiding difficulties. In what some see as an ominous trend, food production, once India’s great pride, has failed to keep pace with the nation’s population growth in the last decade. The cries of Indian farmers — or what Prime Minister Singh recently described as their “acute distress” — can hardly be neglected by the leaders of a country where two-thirds of people still live in the countryside. Mr. Singh’s government has responded to the current crisis by promptly expanding rural credit and promising investments in rural infrastructure. It has also offered several quick fixes, including a $156 million package to rescue “suicide prone” districts across the country and a promise to expand rural credit, waive interest on existing bank loans and curb usurious informal moneylenders. But pressure is building to do more. Many, including Mr. Swaminathan, the agricultural scientist, would like to see the government help farmers survive during crop failures or years of low world prices. Subsidies, once a linchpin of Indian economic policy, have dried up for virtually everyone but the producers of staple food grains. Indian farmers now must compete or go under. To compete, many have turned to high-cost seeds, fertilizers and pesticides, which now line the shelves of even the tiniest village shops. Monsanto, for instance, invented the genetically modified seeds that Mr. Shende planted, known as Bt cotton, which are resistant to bollworm infestation, the cotton farmer’s prime enemy. It says the seeds can reduce the use of pesticides by 25 percent. The company has more than doubled its sales of Bt cotton here in the last year, but the expansion has been contentious. This year, a legal challenge from the government of the state of Andhra Pradesh forced Monsanto to slash the royalty it collected from the sale of its patented seeds in India. The company has appealed to the Indian Supreme Court. The modified seeds can cost nearly twice as much as ordinary ones, and they have nudged many farmers toward taking on ever larger loans, often from moneylenders charging exorbitant interest rates. Virtually every cotton farmer in these parts, for instance, needs the assistance of someone like Chandrakant Agarwal, a veteran moneylender who charges 5 percent interest a month. He collects his dues at harvest time, but exacts an extra premium, compelling farmers to sell their cotton to him at a price lower than it fetches on the market, pocketing the profit. His collateral policy is nothing if not inventive. The borrower signs a blank official document that gives Mr. Agarwal the right to collect the farmer’s property at any time. Indeed, one or two crop failures, an unexpected health expense or the marriage of a daughter have become that much more perilous in a livelihood where the risks are already high. A government survey released last year found that 40 percent of farmers said they would abandon agriculture if they could. The study also found that farming represented less than half the income of farmer households. Barely 4 percent of all farmers insure their crops. Nearly 60 percent of Indian agriculture still depends entirely on the rains, as in Mr. Shende’s case. This year, waiting for a tardy monsoon, Mr. Shende sowed his fields three times with the genetically modified seeds made by Monsanto. Two batches of seed went to waste because the monsoon was late. When the rains finally arrived, they came down so hard that they flooded Mr. Shende’s low-lying field and destroyed his third and final batch. Mr. Shende shouldered at least four debts at the time of his death: one from a bank, two procured on his behalf by his sisters and one from a local moneylender. The night before his suicide, he borrowed one last time. From a fellow villager, he took the equivalent of $9, roughly the cost of a one-liter bottle of pesticide, which he used to take his life. Those like him with small holdings are particularly vulnerable. A study by Srijit Mishra, a professor at the Mumbai-based Indira Gandhi Institute of Development Research, found that more than half of the suicides in this part of the country were among farmers with less than five acres of land. But even those who are prosperous by local standards are not immune. Manoj Chandurkar, 36, has 72 acres of cotton with genetically modified seeds and sorghum in a neighboring village called Waifad. Every year is a gamble, he said. Each time, he takes out a loan, then another and then prays that the bollworms will stay away and the rains will be good. On his shoulders today sit three loans, bringing his total debt to $10,000, a vast sum here. The study by Mr. Mishra found that 86.5 percent of farmers who took their own lives were indebted — their average debt was about $835 — and 40 percent had suffered a crop failure. The news of Mr. Shende’s death brought his wife, Vandana, back home to Bhadumari. Relatives said she had gone to tend to her sick brother in a nearby village. By the time she arrived, her husband’s body was covered by a thin checkered cloth. A policeman had recorded the death — the eighth in six months for the officer. Ms. Shende, squatting in the narrow village lane, shrouded her face in her cheap blue sari and wailed at the top of her lungs. “Your father is dead,” she screamed at her small son, who stood before her, dazed. When Prince Charles claimed thousands of Indian farmers were killing themselves after using GM crops, he was branded a scaremonger. In fact, as this chilling dispatch reveals, it's even WORSE than he feared. The children were inconsolable. Mute with shock and fighting back tears, they huddled beside their mother as friends and neighbours prepared their father's body for cremation on a blazing bonfire built on the cracked, barren fields near their home. As flames consumed the corpse, Ganjanan, 12, and Kalpana, 14, faced a grim future. While Shankara Mandaukar had hoped his son and daughter would have a better life under India's economic boom, they now face working as slave labour for a few pence a day. Landless and homeless, they will be the lowest of the low. Shankara, respected farmer, loving husband and father, had taken his own life. Less than 24 hours earlier, facing the loss of his land due to debt, he drank a cupful of chemical insecticide. Unable to pay back the equivalent of two years' earnings, he was in despair. He could see no way out. There were still marks in the dust where he had writhed in agony. Other villagers looked on - they knew from experience that any intervention was pointless - as he lay doubled up on the ground, crying out in pain and vomiting. Moaning, he crawled on to a bench outside his simple home 100 miles from Nagpur in central India. An hour later, he stopped making any noise. Then he stopped breathing. At 5pm on Sunday, the life of Shankara Mandaukar came to an end. As neighbours gathered to pray outside the family home, Nirmala Mandaukar, 50, told how she rushed back from the fields to find her husband dead. 'He was a loving and caring man,' she said, weeping quietly. Shankara's crop had failed - twice. Of course, famine and pestilence are part of India's ancient story. But the death of this respected farmer has been blamed on something far more modern and sinister: genetically modified crops. Shankara, like millions of other Indian farmers, had been promised previously unheard of harvests and income if he switched from farming with traditional seeds to planting GM seeds instead. Beguiled by the promise of future riches, he borrowed money in order to buy the GM seeds. But when the harvests failed, he was left with spiralling debts - and no income. So Shankara became one of an estimated 125,000 farmers to take their own life as a result of the ruthless drive to use India as a testing ground for genetically modified crops. The crisis, branded the 'GM Genocide' by campaigners, was highlighted recently when Prince Charles claimed that the issue of GM had become a 'global moral question' -- and the time had come to end its unstoppable march. Speaking by video link to a conference in the Indian capital, Delhi, he infuriated bio-tech leaders and some politicians by condemning 'the truly appalling and tragic rate of small farmer suicides in India, stemming... from the failure of many GM crop varieties'. Ranged against the Prince are powerful GM lobbyists and prominent politicians, who claim that genetically modified crops have transformed Indian agriculture, providing greater yields than ever before. The rest of the world, they insist, should embrace 'the future' and follow suit. So who is telling the truth? To find out, I travelled to the 'suicide belt' in Maharashtra state. What I found was deeply disturbing -- and has profound implications for countries, including Britain, debating whether to allow the planting of seeds manipulated by scientists to circumvent the laws of nature. For official figures from the Indian Ministry of Agriculture do indeed confirm that in a huge humanitarian crisis, more than 1,000 farmers kill themselves here each month. Simple, rural people, they are dying slow, agonising deaths. Most swallow insecticide -- a pricey substance they were promised they would not need when they were coerced into growing expensive GM crops. It seems that many are massively in debt to local money-lenders, having over-borrowed to purchase GM seed. Pro-GM experts claim that it is rural poverty, alcoholism, drought and 'agrarian distress' that is the real reason for the horrific toll. But, as I discovered during a four-day journey through the epicentre of the disaster, that is not the full story. In one small village I visited, 18 farmers had committed suicide after being sucked into GM debts. In some cases, women have taken over farms from their dead husbands -- only to kill themselves as well. Latta Ramesh, 38, drank insecticide after her crops failed -- two years after her husband disappeared when the GM debts became too much. She left her ten-year-old son, Rashan, in the care of relatives. 'He cries when he thinks of his mother,' said the dead woman's aunt, sitting listlessly in shade near the fields. Village after village, families told how they had fallen into debt after being persuaded to buy GM seeds instead of traditional cotton seeds. The price difference is staggering: £10 for 100 grams of GM seed, compared with less than £10 for 1,000 times more traditional seeds. But GM salesmen and government officials had promised farmers that these were 'magic seeds' -- with better crops that would be free from parasites and insects. 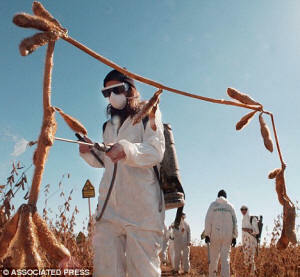 Indeed, in a bid to promote the uptake of GM seeds, traditional varieties were banned from many government seed banks. The authorities had a vested interest in promoting this new biotechnology. Desperate to escape the grinding poverty of the post-independence years, the Indian government had agreed to allow new bio-tech giants, such as the U.S. market-leader Monsanto, to sell their new seed creations. In return for allowing western companies access to the second most populated country in the world, with more than one billion people, India was granted International Monetary Fund loans in the Eighties and Nineties, helping to launch an economic revolution. But while cities such as Mumbai and Delhi have boomed, the farmers' lives have slid back into the dark ages. Though areas of India planted with GM seeds have doubled in two years -- up to 17 million acres -- many farmers have found there is a terrible price to be paid. Far from being 'magic seeds', GM pest-proof 'breeds' of cotton have been devastated by bollworms, a voracious parasite. Nor were the farmers told that these seeds require double the amount of water. This has proved a matter of life and death. With rains failing for the past two years, many GM crops have simply withered and died, leaving the farmers with crippling debts and no means of paying them off. Having taken loans from traditional money lenders at extortionate rates, hundreds of thousands of small farmers have faced losing their land as the expensive seeds fail, while those who could struggle on faced a fresh crisis. When crops failed in the past, farmers could still save seeds and replant them the following year. But with GM seeds they cannot do this. That's because GM seeds contain so- called 'terminator technology', meaning that they have been genetically modified so that the resulting crops do not produce viable seeds of their own. As a result, farmers have to buy new seeds each year at the same punitive prices. For some, that means the difference between life and death. Take the case of Suresh Bhalasa, another farmer who was cremated this week, leaving a wife and two children. As night fell after the ceremony, and neighbours squatted outside while sacred cows were brought in from the fields, his family had no doubt that their troubles stemmed from the moment they were encouraged to buy BT Cotton, a genetically modified plant created by Monsanto. Asked if the dead man was a 'drunkard' or suffered from other 'social problems', as alleged by pro-GM officials, the quiet, dignified gathering erupted in anger. 'No! No!' one of the dead man's brothers exclaimed. 'Suresh was a good man. He sent his children to school and paid his taxes. Monsanto has admitted that soaring debt was a 'factor in this tragedy'. But pointing out that cotton production had doubled in the past seven years, a spokesman added that there are other reasons for the recent crisis, such as 'untimely rain' or drought, and pointed out that suicides have always been part of rural Indian life. Officials also point to surveys saying the majority of Indian farmers want GM seeds -- no doubt encouraged to do so by aggressive marketing tactics. During the course of my inquiries in Maharastra, I encountered three 'independent' surveyors scouring villages for information about suicides. They insisted that GM seeds were only 50 per cent more expensive -- and then later admitted the difference was 1,000 per cent. Prince Charles is so distressed by the plight of the suicide farmers that he is setting up a charity, the Bhumi Vardaan Foundation, to help those affected and promote organic Indian crops instead of GM. India's farmers are also starting to fight back. As well as taking GM seed distributors hostage and staging mass protests, one state government is taking legal action against Monsanto for the exorbitant costs of GM seeds. But the debt does not die with her husband: unless she can find a way of paying it off, she will not be able to afford the children's schooling. They will lose their land, joining the hordes seen begging in their thousands by the roadside throughout this vast, chaotic country. Cruelly, it's the young who are suffering most from the 'GM Genocide' -- the very generation supposed to be lifted out of a life of hardship and misery by these 'magic seeds'. Here in the suicide belt of India, the cost of the genetically modified future is murderously high.